1000 lb cargo hauler with roller-bearing action. Aftermarket package ships with 48" U-channel and L-bracket for trim and stiffener. 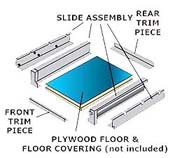 If longer trim is needed, order from Trim Kit listing and cut to fit. Fits almost any sub-floor compartment. Fixed position, heavy-duty roller bearings provide smooth operation. A spring-loaded latch locks the slide in three positions. Easy to assemble. Color Matched trim pieces available for the deck. Width is defined by the size of the compartment. 2. 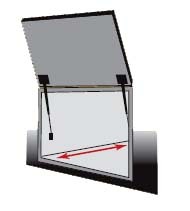 Determine desired width, allowing 3" for frame sides. Cut a section of 3/4" plywood (not supplied) and both trim pieces (if needed). Attach plywood to inner slide frame. 3. 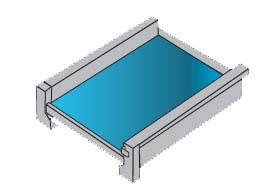 Square outer slide frame. Mark support holes, drill, and secure outer frame through the basement floor.